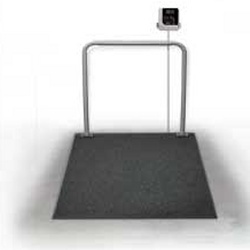 The Summit Dialysis Scale is designed to be mounted in a pit flush with the floor, or above ground with optional ramps for easy-access, multipurpose weighing. The patient simply walks, or is wheeled, onto the weighing platform to be weighed. The Summit Dialysis Scale provides exceptional performance in dialysis centers, hospitals, and other healthcare environments. While economically priced, the Summit Dialysis Scale also employs a rugged design to deliver efficient installation and operate consistently over a long period of time. The Summit Dialysis Scale is designed to be mounted in a pit flush with the floor, or above ground with optional ramps for easy-access, multipurpose weighing. The patient simply walks, or is wheeled, onto the weighing platform to be weighed. The heavy-duty handrail provides patient safety and convenience, and is positioned to remain clear of wheelchairs.